Microcirculation and hemodynamic disturbances, including in the cochlea, are commonly found in diabetic patients. A study on diabetic rats discovered histopathological changes in outer hair cells and the spiral ganglion and mitochondrial damage in the ear. Hyperglycemia can increase the activation of protein kinase C (PKC). Curcumin as an antioxidant also affects the regulation of PKC and Ca2+. The aim of this study was to determine the role of curcumin in decreasing PKC expression in the cochlear fibroblasts of diabetic rats. An experimental study was performed on 24 Wistar rats divided into the following 6 groups: group 1: control group; group 2: diabetic group without curcumin administration; groups 3 and 4: diabetic groups with curcumin administration (200 mg/kg and 400 mg/kg for 3 days, respectively); groups 5 and 6: diabetic groups with curcumin administration (200 mg/kg and 400 mg/kg for 8 days, respectively). Cochlear tissues were taken from all groups and immunohistochemistry-stained, and the PKC expression scores were analyzed with one-way ANOVA (a significance level of 0.05). Significant differences in PKC expression (p<0.05) were found between group 1 and group 2, and group 2 and groups 3, 4, 5, and 6. There was no significant difference in PKC expression regarding the different doses and the duration of curcumin administration. Curcumin can reduce PKC expression in the cochlear fibroblasts of diabetic rats. A similar result can also be found in a study conducted by Lee et al.,3 which found histologic abnormalities, such as degeneration of the organ of Corti and spiral ganglion cells, related to hyperglycemia and obesity. The role of curcumin in the treatment and prevention of hearing loss through its inhibitory mechanism towards PKC in the cochlear fibroblasts of diabetic rats (Rattus norvegicus) has never been studied, and so the objective of the present study was to demonstrate the role of curcumin in reducing PKC expression in the cochlear fibroblasts of diabetic rats. This study was an experimental study with a randomized posttest-only control group design using Wistar rats (R. norvegicus) that were male, healthy, and average weight 200 g.
The 24 rats were divided into 6 groups, with 4 rats in each group. The rats were obtained from the Laboratory of Biochemistry, Faculty of Medicine, Universitas Airlangga, Surabaya, Indonesia. 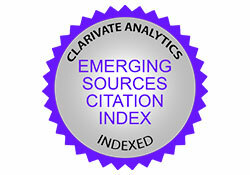 To ensure that all the procedures were ethically acceptable, a proposal was submitted to the Research Ethics Committee. This study earned approval from the Health Research Ethics Committee of Universitas Sumatera Utara, Indonesia, no. 433/KOMET/FKUSU/2015. In the study, after the white rats had adapted to the cage environment in the laboratory for 2 weeks, they were treated according to the plan. Group 1 (control group) was injected with a single dose of sodium citrate, obtained from 1.47 g of sodium citrate solution in 50 mL of dH2O intraperitoneally on the 1st day, and then terminated on the 5th day. Group 2 was injected with a single dose of streptozotocin (STZ) (Bioworld, USA) 60 mg/kgbw, and then terminated on the 5th day. Group 3 was injected with a single dose of STZ 60 mg/kgbw followed by curcumin 200 mg/kgbw/day orally for 3 days and terminated on the 5th day. Group 4 was injected with a single dose of STZ 60 mg/kgbw followed by curcumin 400 mg/kgbw/day orally for 3 days and terminated on the 5th day. Group 5 was injected with a single dose of STZ 60 mg/kkgbw followed by curcumin 200 mg/kgbw/day orally for 8 days and terminated on the 10th day. Group 6 was injected with a single dose of STZ 60 mg/kgbw followed by curcumin 400 mg/kgbw/day orally for 8 days and terminated on the 10th day. The rats were fasted for 4 h to empty the stomach and decrease the risk of aspiration. Induction was performed on the rats by injecting STZ solution 60 mg/kgbw11 intraperitoneally with the required doses mentioned above (diabetic groups: groups 2-6). In order to avoid sudden postinjection hypoglycemia, the rats were given sucrose 10% or dextrose 10% solution throughout the 1st night. Every morning, the fasting blood sugar levels of the rats were examined with an Advance Glucometer (Boehringer Mannheim, Germany) by taking blood from the peripheral blood vessel in the tail. Hyperglycemia is diagnosed when the blood sugar level is >200 mg/dL after 48 h of STZ induction.12 If the blood sugar is <200 mg/dL then the rats are eliminated from the sample. After being diagnosed as hyperglycemic, the rats were given curcumin according to the required dose per group and they were terminated after the procedure. Powdered curcumin was used at the level of 16.62±0.14% b/b using thin layer chromatography – densitometry. The given preparation included powdered curcumin at a dose of 200 mg/kgbw/day and 400 mg/kgbw/day per rat suspended in carboxymethyl cellulose 0.5% and administered orally into the stomach of the rat via a nasogastric tube. Termination was conducted on rats in all groups by temporal bone necropsy. The tissue sample taken was fixated with buffered formalin solution 10% and decalcified with EDTA for 4 weeks. Each tissue sample was prepared in paraffin blocks and sliced into 4-µm-thick sections and placed inside the glass object and then stained with hematoxylin-eosin and immunohistochemical staining of PKC was performed with polyclonal anti-PKC antibody (catalogue#: ENT3752, Elabscience). To analyze the mean differences between more than two groups, one-way ANOVA was used (a significance level of 0.05). Before one-way ANOVA, we used the Shapiro–Wilk test to prove that the data were normally distributed and post-hoc tests to see the differences of groups. Mean differences in PKC expression were seen in all groups. The lowest PKC expression was found in the control group and the highest PKC expression was found in the diabetic group without curcumin administration (chart 1). It is also shown in Chart 1 that the diabetic groups administered curcumin (groups 3-6) had lower mean values of PKC expression compared to the diabetic group not administered curcumin (group 2). 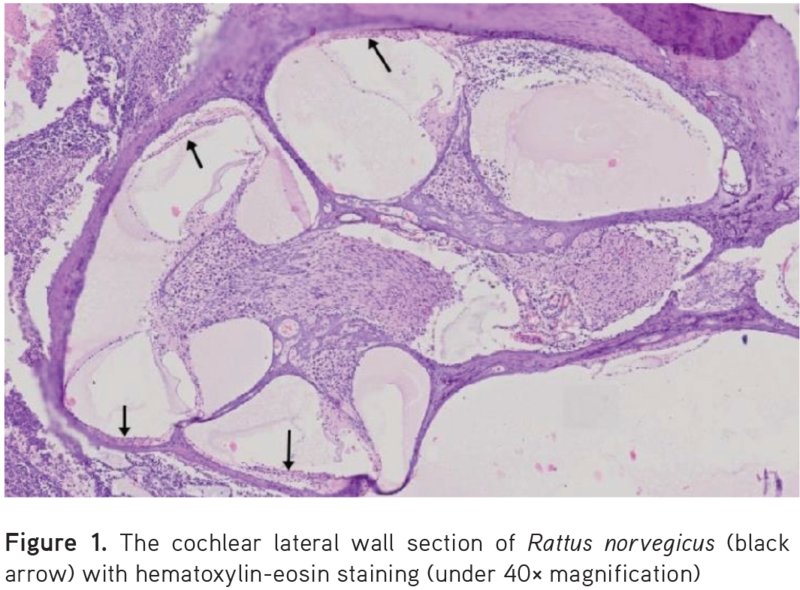 In order to get a proper and detailed view of the cochlear tissue histopathologically, hematoxylin-eosin staining was performed and used as a comparison for further immunohistochemical staining (Figure 1). Clinical test results of curcumin in decreasing PKC expression in the cochlear fibroblasts of diabetic rats can be seen in Figure 2. The fibroblasts in the diabetic group (group 2) showed higher density compared to the other groups, whereas the fibroblasts within the diabetic group administered curcumin (groups 3-6) showed lower density. The results obtained from the histopathological examination above were then processed and analyzed statistically to find the differences between each group and the interpreted results are shown in Table 1. 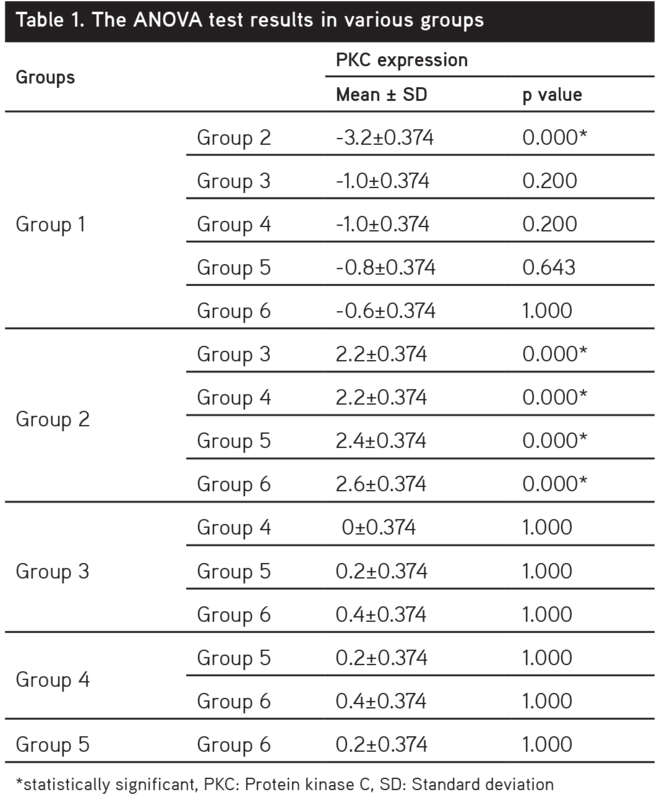 According to Table 1, there was a statistically significant difference (p<0.05) in the mean value of PKC expression between group 1 and the diabetic group not administered curcumin (group 2). As shown in Table 1, the administration of curcumin in the diabetic groups (groups 3-6) decreased PKC expression significantly (p<0.05) compared to the diabetic group not administered curcumin (group 2). According to Table 1, the different doses (200 and 400 mg/kgbw/day) and the duration of curcumin administration (3 and 8 days) showed no statistically significant differences (p>0.05) in PKC expression. To help identify the gene that plays a role in the human auditory system, rats were used as the experimental animal since they are genetically similar to humans (>70%).16 The objective of this study was to determine the role of curcumin in decreasing PKC expression in the cochlear fibroblasts of diabetic rats (R. norvegicus). Earlier studies have not proved any effect of curcumin on PKC expression in the lateral wall of cochlear fibroblasts in diabetic model rats. 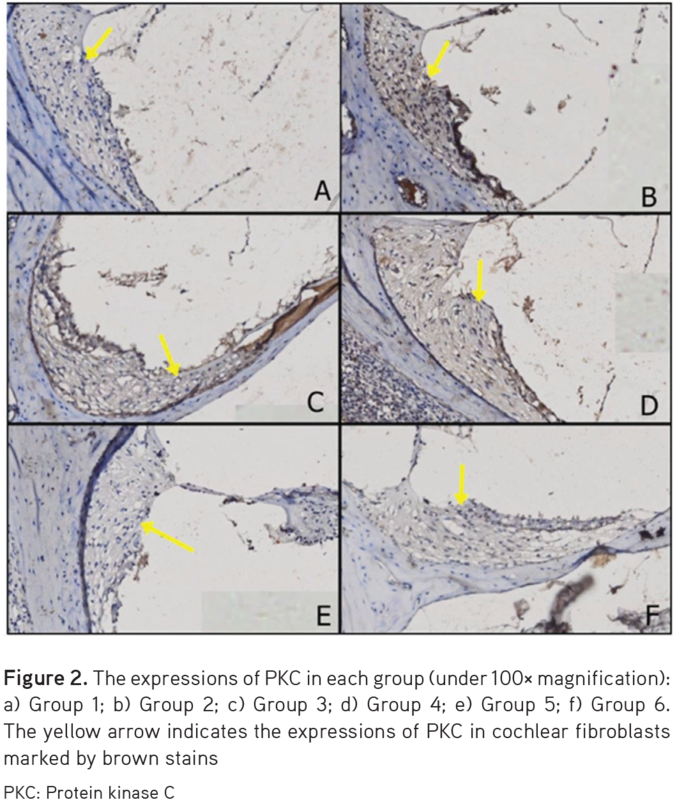 This study is the first to prove that curcumin is able to decrease the expression of PKC in the lateral wall of cochlear fibroblasts in these rats. A significant difference in the mean value of PKC expression between the control group and the diabetic group not administered curcumin was found in this study. Curcumin as an antioxidant can inhibit ROS via the PKC pathway and calcium regulation.10 This discovery strengthens the presumption that hyperglycemia will cause cellular dysfunction that activates PKC persistently and stimulates the continuous synthesis of endogenous ROS, leading to cell damage, including cochlear fibroblasts. In the present study, there were differences in the mean values of PKC expression in all groups. The lowest PKC expression was found in group 1 and the highest PKC expression was found in group 2. Thereby, in the STZ-induced diabetes group, PKC expression was increased due to the continuous activation of the PKC pathway. In the present study, groups 3, 4, 5, and 6 (diabetic groups administered curcumin) showed lower mean values of PKC expression compared to group 2 (diabetic group not administered curcumin). The decreased mean values of PKC expression in the STZ-induced diabetes groups receiving curcumin was due to the activity of curcumin, which can eliminate the formation of ROS, thereby inhibiting PKC activation at the cellular level. A similar study conducted by Kao et al.23 found significant inhibition in PKC expression in patients with hepatocellular carcinoma (Hep 3B cell) treated by curcumin. The decreased expression mechanism of PKC is not fully understood, but many previous in vivo and in vitro studies have shown a strong indication of decreased expression of PKC caused by curcumin acting as a noncompetitive and selective inhibitor of phosphorylase kinase. Similarly, the study carried out by Jancinova et al.25 observed that curcumin can inhibit PKC in the neutrophils of Lewis rats suffering from arthritis in vitro or experimentally. In the present study, the different doses of curcumin, 200 mg/kgbw/day and 400 mg/kgbw/day, with duration of 3 and 8 days showed no statistically significant differences (p>0.05) in PKC expression. Nevertheless, the administration of a higher dose of curcumin with a longer duration (group 6) demonstrated more decreased PKC expression compared to a lower dose of curcumin with a shorter duration (group 3). According to this study, we conclude that curcumin is an antioxidant that mechanically inhibits PKC expression in the cochlear fibroblasts of diabetic rats administered curcumin of either 200 mg/kgbw/day or 400 mg/kgbw/day for 3 days or 8 days. Curcumin is considered a therapeutic agent that is effective in repairing fibroblast damage in the cochlear lateral wall caused by DM, which was determined through the expression of PKC. This study can act as basic scientific research in traditional therapy to manage hearing loss caused by DM in the future. This study was supported by DIPA Direktorat Penelitian dan Pengabdian kepada Masyarakat, Universitas Sumatera Utara 2015. Malucelli DA, Malucelli FJ, Fonseca VR, Zeigeboim B, Ribas A, Trotta FD, Silva TP. Hearing loss prevalence in patients with diabetes mellitus type 1. Braz J Otorhinolaryngol. 2012;78:105-115. Xipeng L, Ruiyu L, Meng L, Yanzhuo Z, Kaosan G, Liping W. Effect of Diabetes on Hearing and Cochlear Structures. J Otology. 2013;8:82-87. Lee HS, Kim KR, Chung WH, Cho YS, Hong SH. Early Sensorineural Hearing Loss in Ob/Ob Mouse, an Animal Model of Type 2 Diabetes. Clin Exp Otorhinolaryngol. 2008;1:211-216. Noh H, King GL. The role of protein kinase C activation in diabetic nephropathy. Kidney Int Suppl. 2007;72:49-53. Aronson D. Hyperglycemia and the pathobiology of diabetic complications. 2nd ed. Fisman EZ, Tenenbaum A. Cardiovascular Diabetology: Clinical, Metabolic and Inflammatory Facets. Adv Cardiol. 2008;1:16. Geraldes P, King GL. Activation of Protein Kinase C Isoform and Its Impact on Diabetic Complications. Circ Res. 2010;106:1319-1331. Correa F, Buelna-Chontal M, Hernández-Reséndiz S, García-Niño WR, Roldán FJ, Soto V, Silva-Palacios A, Amador A, Pedraza-Chaverrí J, Tapia E, Zazueta C. Curcumin maintains cardiac and mitochondrial function in chronic kidney disease. Free Radic Biol Med. 2013;61:119-129. Trujillo J, Chirino YI, Molina-Jijón E, Andérica-Romero AC, Tapia E, Pedraza-Chaverrí J. Renoprotective effect of the antioxidant curcumin: Recent Findings. Redox Biol. 2013;1:448-456. Yadav SK, Sah AK, Jha RK, Sah P, Shah DK. Turmeric (curcumin) remedies gastroprotective action. Pharmacogn Rev. 2013;7:42-46. Balasubramanyam M, Koteswari AA, Kumar RS, Monickaraj SF, Maheswari JU, Mohan V. Curcumin-induced inhibition of cellular reactive oxygen species generation: Novel therapeutic implications. J Biosci. 2003;28:715-721. 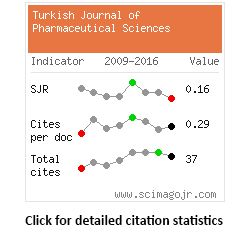 Ragbetli C, Ebubekir C. Effect of Streptozotocin on Biochmical Parameters in Rats. Asian J Chem. 2010;22:2376-2378. Wongeakin N, Sridulyakul P, Jariyapongskul A, Suksamrarn A, Patumraj S. Effects of curcumin and tetrahydrocurcumin on diabetes induced endothelial dysfunction. Afr J Biochem Res. 2009;3:259-265. Tan KB, Putti TC. Cyclooxigenase 2 expression in nasopharyngeal carcinoma: immunohistochemical findings and potential implication. J Clin Pathol. 2005;5:535-538. Austin DF, Konrad-Martin D, Griest S, McMillan GP, McDermott D, Fausti S. Diabetes-Related Change in Hearing. Laryngoscope. 2009;119:1788-1796. Maia CA, Campos CA. Diabetes Mellitus as etiological factor of hearing loss. Braz J Ottorinolaringol. 2005;71:208-214. Gravel JS, Ruben RJ. Auditory Deprivation and Its Consequences: From Animal Models to Human. In: Van De Water TR, Popper AN, Fay RR, eds. Clinical Aspect of Hearing. New York; Springer; 1996:86-92. González-Salazar A, Molina-Jijón E, Correa F, Zarco-Márquez G, Calderón-Oliver M, Tapia E, Zazueta C, Pedraza-Chaverri J. Curcumin Protects from Cardiac Reperfusion Damage by Attenuation of Oxidant Stress and Mitochondrial Dysfunction. Cardiovasc Toxicol. 2011;11:357-364. Van Erk MJ, Teuling E, Staal YC, Huybers S, Van Bladeren PJ, Aarts JM, Van Ommen B. Time-and dose-dependent effects of curcumin on gene expression in human colon cancer cells. J Carcinog. 2004;3:8. Koya D, King GL. Protein Kinase C Activation and the Development of Diabetic Complications. Diabetes. 1998;47:859-866. Oshiro Y, Lee Y, King G. Mechanism of diabetic neprhopathy: role of protein kinase-c activation. Advanced Studies in Medicine. 2005;5:10-19. Nishizuka Y. Intracelluler Signaling by Hydrolysis of Phospholipids and Activation of Protein Kinase C. Science. 1992;258:607-614. Gutterman D. Vascular Dysfunction in Hyperglycemia: Is Protein Kinase C the Culprit? Circ Res. 2002;90:5-7. Kao HH, Wu CJ, Won SJ, Shin JW, Liu HS, Su CL. Kinase Gene Expression and Subcellular Protein Expression Pattern of Protein Kinase C Isoform in Curcumin-treated Human Hepatocelluler Carcinoma Hep 3B Cells. Plant Foods Hum Nutr. 2011;66:136-142. Reddy S, Aggarwal BB. Curcumin is a non-competitive and selective inhibitor of phosphorylase kinase. FEBS Lett. 1994;94:19-22. Jancinova V, Perecko T, Nosal R, Kostalova D, Bauerova K, Drabikova K. Decreased activity of neutrophils in the presence of diferuloylmethane (curcumin) involves protein kinase C inhibition. Eur J Pharmacol. 2009;612:161-166. Menon VP, Sudheer AR. Antioxidant and inflammatory properties of curcumin. Adv Exp Med Biol. 2007;595;105-125.